I thought long and hard before writing this post. As a disclaimer, I am not in any way promoting luxury goods. It's common sense that we take care the necessities before the luxuries. They're called "luxury" for a reason. They're nice things to have. 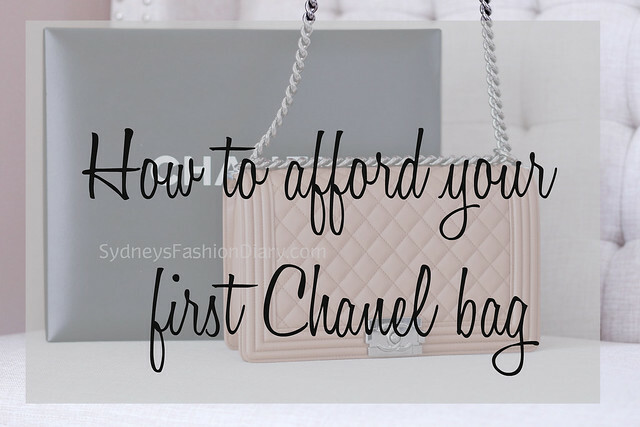 If your finances are in balance and you wanted to add a little luxury to your life, below are some practical tips to help you save for your very first designer handbag. 1. Get rid of things that you're no longer care for: Throughout the years, I sold several of my designer handbags that I was no longer care for (including this Louis Vuitton bag and this Burberry bag). My taste in fashion changes as I get older and I don't care for logo handbags anymore. Instead of letting them sit in my closet, I ended up selling them and put away the money for future purchases. 2. Focus on where to invest: If you're a long time follower of this blog then you know I rarely spend $$ on expensive clothes. People might think why does she wear affordable clothes from Asia retailers all the time? Well, because designer clothes are not my thing. I am just happy as a clam wearing clothes from Target. If I have a certain amount to spend on clothes, I'd spend maybe a quarter of it on clothes and put the rest into my handbag fund. With that being said, will I ever buy a handbag from Target? Probably not. Nothing against Target handbags. I won't do so because I have high expectations when it comes to handbags. The key is to focus on what you want and prioritize your purchases. 3. Have a goal and work towards it: My husband and I have 7 separate accounts (primary checking/savings, the girls' accounts, an account for major purchases, vacation and automotive). Why automotive, you ask? We feel very blessed to have 2 luxury cars. However, they come with hefty maintenance bills. One time we got hit really hard with a repair bill and have learned our lesson. Since then, we set aside a small amount of money each month just in case something unexpectedly happens. We set up recurring automatic transfers into these accounts every time we get paid. If a luxury handbag is what you're going after, set aside a certain amount of money from each paycheck. Nothing is more satisfying than seeing the wonderful results of your efforts. By doing so, it won't have a big impact on your current financial situation. 4. Contributions for special occasions: This doesn't apply to someone outside your family. For special occasions such as birthdays and Christmas, I kindly ask my family members for monetary gifts. God knows I don't need anymore clothes. Instead of filling my closet with more unnecessary things, I just put the $$ towards a bigger purchase. 5. Open to pre-owned options: I bought my very first Chanel handbag pre-owned for $1200 (which is unheard of these days). Two years later, I sold it for $1800 (made a 50% profit on the bag!). I then bought a Chanel jumbo for $2500. A year later, I sold it for $3100. I mentioned these number for the sole purpose of letting you know that you can make a profit on certain bags. If you're open to pre-owned handbags, they're certainly more "affordable" and can be acquired quicker. Read more about how to buy pre-owned luxury handbags here. I hope you enjoy this post and take it as it was intended. Luxury items are only enjoyable if you can truly afford them. At the end of the day, they're just things and I wholeheartedly believe there are many many precious things to enjoy in life than luxury handbags. Great tips, Sydney! My problem is not knowing where to sell the handbags I don't use any more. Like you, I don't like designer logos/monogram as I've gotten older. I'd love to turn into some $ for other purchases. Any advice on how and where I should start for selling luxury bags? I've never sold anything before. Thanks! I second the previous comment, my style changed as I grow older , the bags that I bought before had been collecting dust in my closet, I've never sold anything before too, Would love to hear your tips about selling bags. Thanks! @Anonymous , @Unknown I will cover this topic along with my recommendations next Friday. Thanks for stopping by! Good tips. Such a pretty bag! Great post Sydney! You know I love sharing finances and fashion so reading this was exciting! We share a love for luxury things and for me it's normally my automobiles and things for my home. I never considered a pre owned bag but you have expanded my mind to the idea...so thank you. Great minds think alike ;) I posted something on buying Chanel too yesterday! Anyway, great tips and I agree 100% with buying pre-owned! Hi Sydney - I am interested in selling bags that I no longer have a need for. What platform do you recommend for selling handbags?